Watch the clear sky or the sunset or just glare at the moon as you dine at North West Corner. Located in Vaishali Nagar, Jaipur, North West Corner is a casual dine that is ideal for the ones looking for a corporate meeting, a dinner date or a family dinner. 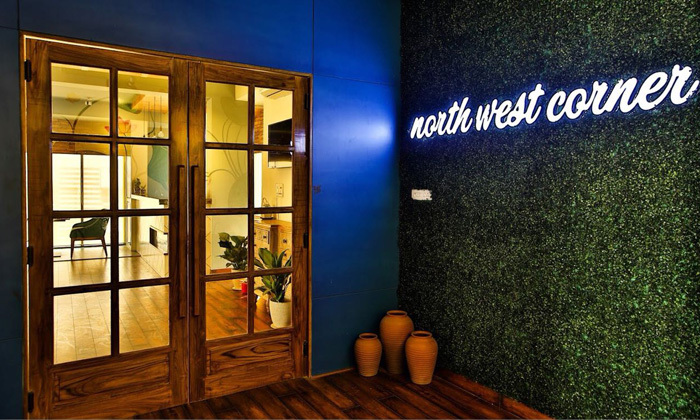 Serving a collective range of North Indian, Chinese, Modern Indian and Continental delicacies, you will get to experience a blend of colourful food, exotic ingredients amidst a spacious rooftop ambience when at North West Corner. Not just this, the indoor seating is a sight to behold that features matched upholstery with wooden tables, blue velvet cushiony chairs paired up with a fancy ceiling and marble flooring. The chic and contemporary decor, commitment to quality and with the idea to provide a perfect place for a happy dining experience away from all your hectic schedules, they ensure customers are satisfied with every visit. They win over customers with their overwhelming hospitality and delicious dishes.